Scrolling through the ole’ bloglines the other day, I popped in on Carole and found yet another knitalong. Only this one reeled me in right away. It is called Lonesome Skein and its goal is to help you use up those lonesome skeins that are sitting around your yarn closet or craft room. I figured that I have a lot of lonesome skeins, but I honestly had no idea. 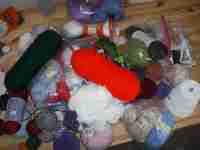 Last night, I got all of the lonesome skeins out of my yarn closet and piled them on my craft table, as seen above. I have more lonesome skeins than I have sets of skeins. This afternoon, I decided to get organized. When I get on an organizational kick, which honestly probably only happens once or twice a year, I occassionally go a little overboard. Ummm…so I made a spreadsheet – lonesome_skein_projects_blog_version.xls. It has a tab for the projects I’m going to make, a tab for the yarn that I have, and a tab for completed projects. I am so excited to get started! This weekend I will determine what I’m going to make first. I’m hoping that I can make one item a week (they are small) from now until Christmas. Some of them will be Christmas presents, some will be baby presents, and some may just be for me. Maybe that will actually give me blog material, too! Hi nice to meet you! I saw your comment on the Lonesome Skein KAL – I’m planning to take out all my orphans too. It’s a scary thing, facing your stash. I am so proud of you!! A spreadsheet! What a way to release the inner OCD in you! Bwaaa-haaa-ha! I nearly choked on my coffee when I got a look at your spreadsheet. I have an incredibly similar one that I created for various yarns (not necessarily ones I have), so that I could find similar yarns to substitute when necessary. But I put the stitch count in a separate column from the row count, so I could sort on it. Tee hee!